If you are cooking turkey on Easter Sunday, this Turkey and Prosciutto Zucchini Bake is a great way to use up any leftovers. This recipe is quick, easy and full of clean eating veggies. A perfect dinner to follow the indulgences of a big weekend brunch, turkey dinner and Easter chocolate ….lots of chocolate 🙂 . 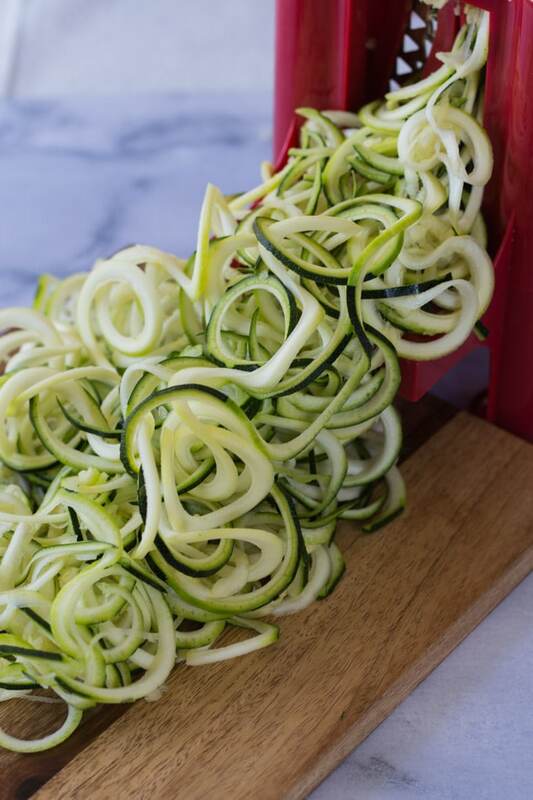 If you don’t own a spiralizer, you could use a julienne peeler. I’ve never tried this so I can’t vouch for how well it works. All I can say is that I love how well my spiralizer works. Just look at how noodle-ly the zucchini looks! To form the noodle base for this recipe, I spiralized 2 well-rounded, large zucchini. The bigger they are, the better they will spiralize. Once spiralized, I mixed up an olive oil/lemon/herb vinaigrette and tossed it with the noodles. I placed the noodles in a 10×7 greased casserole dish and then just started layering on the turkey and vegetables. (You can use a slightly smaller or bigger casserole dish – a small adjustment in the size won’t impact the baking time). It’s really your choice when it comes to the vegetables. 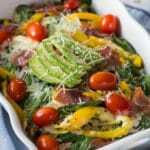 For this recipe, I added bella mushrooms, baby tomatoes, yellow peppers, and spinach. But you could use any kind of peppers, mushrooms, leafy greens and even onions. I would stay away from vegetables that may take a little longer to cook as this Turkey and Prosciutto Zucchini Bake only takes 20 minutes in the oven! 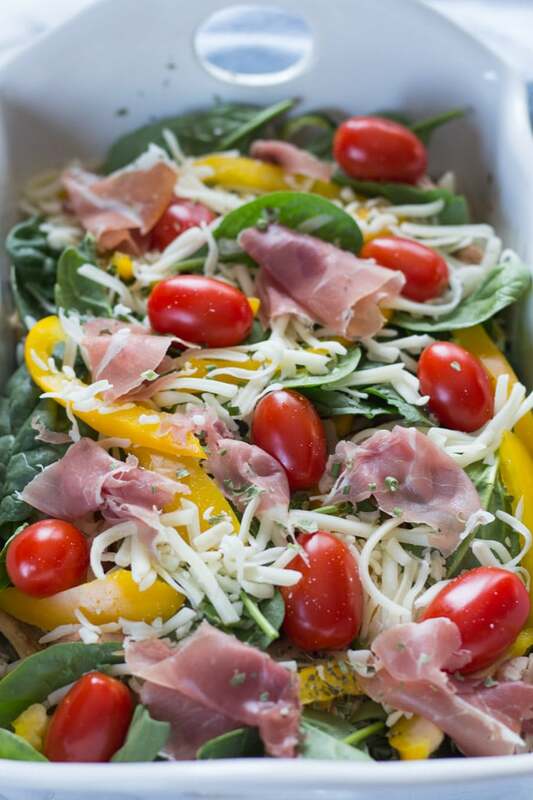 After you layer on the veggies, just add the cheese and a few torn strips of prosciutto, and it’s ready for the oven! Seriously, it takes about 10 minutes to assemble this dish, and another 20 minutes to bake. Supper in 30 minutes on a weeknight? Yes, please! 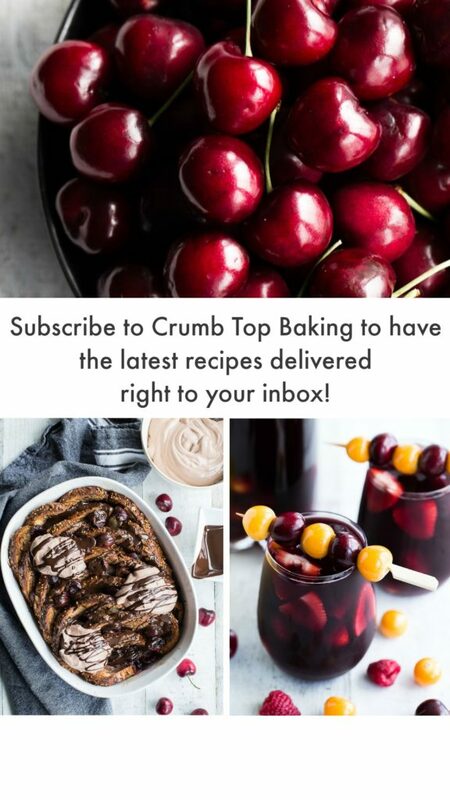 This recipe is gluten free. You can also leave out the cheese and make it dairy free. And if you don’t have prosciutto on hand, you can leave it out, or add some ham or even a bit of turkey bacon. (You might have some ham left over from an Easter brunch? Maybe?). This recipe is totally adaptable to your preferences….and the content of your fridge! You should only bake this dish for about 20 minutes as the zucchini noodles and mushrooms will overcook and release too much liquid. I’ve overbaked this recipe many times (oops), and while it is still tasty, the soupy texture is a bit messy! Plus, your tomatoes will shrivel up, and nobody wants that to happen ;). After you take the Turkey and Prosciutto Zucchini Bake out of the oven, sprinkle a bit of parmesan cheese on top and sliced avocado. And dinner is served! This recipe will serve 2 people. Or you can do what I do, and eat half for supper and bring the rest to work for lunch the next day! 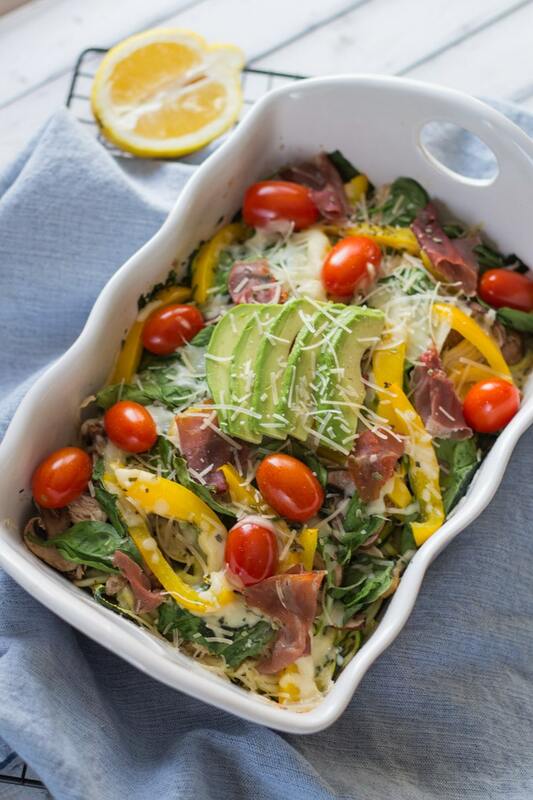 This Turkey and Prosciutto Zucchini Bake is my go-to recipe to use up turkey leftovers. What are yours? Let me know what you think in the comments below! 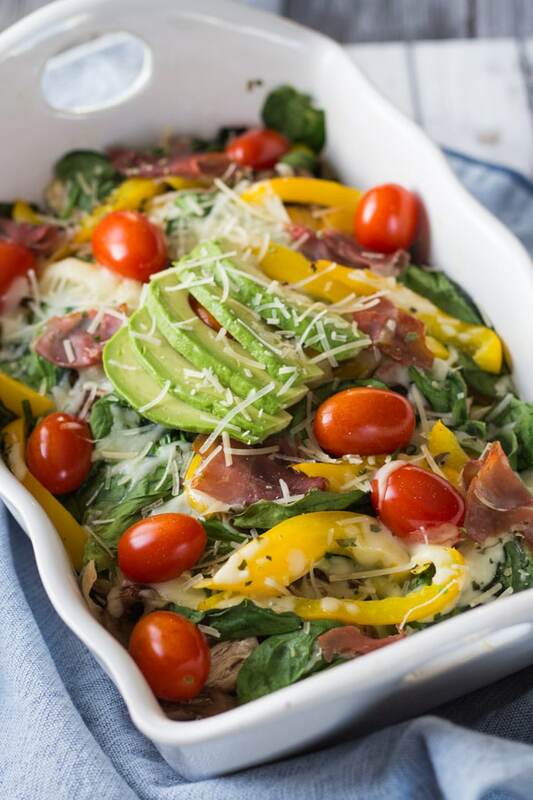 This Turkey and Prosciutto Zucchini Bake is quick, easy and full of clean eating veggies. Ready in 30 minutes! It is also gluten free and can be made dairy free simply by omitting the cheese. 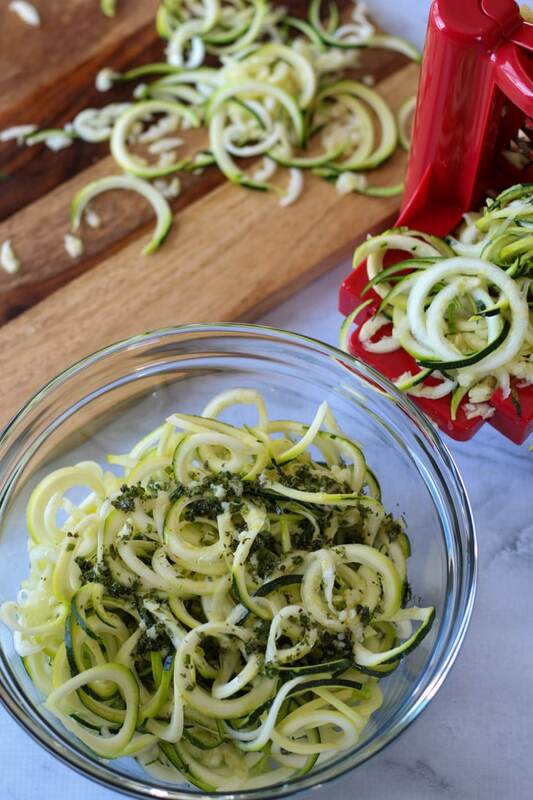 Spiralize the zucchini and add to a medium sized bowl. Combine the olive oil, lemon juice, oregano, chives, garlic, salt and pepper in a small bowl or measuring cup. Stir the mixture and drizzle over the zucchini noodles, then gently toss together. Place the zucchini noodles in a 7×10 greased casserole dish. (Or a similar size of your choosing). Add the turkey on top of the zucchini noodles, and begin layering the veggies on top of the turkey. 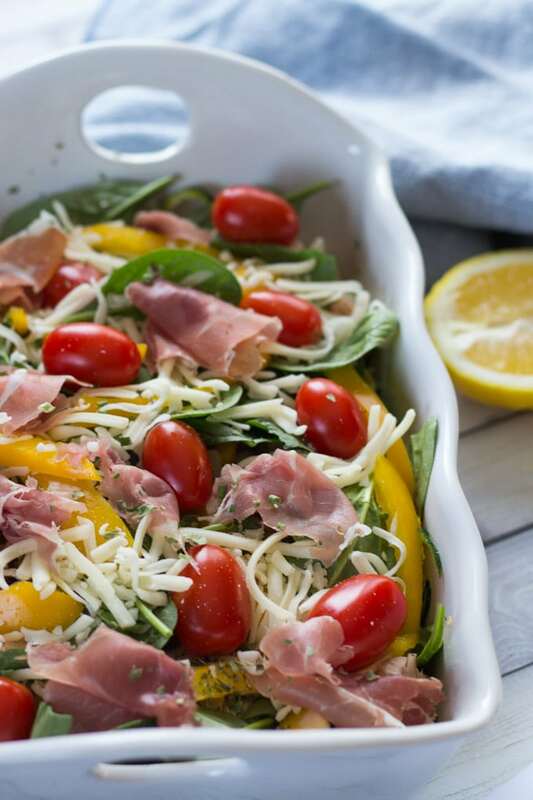 Sprinkle the Italian cheese blend on top of the veggies and then add the prosciutto on top of the cheese. Remove from the oven and sprinkle with parmesan cheese and add sliced avocado on top. Serve and enjoy! Leftovers will keep in the fridge for 2 days. You can omit the cheese and make it dairy free. To avoid soggy noodles and a watery casserole, try not to overbake. A note on herbs – I find fresh herbs have a more pronounced flavour, so I try to use them in recipes whenever I can. But they aren’t always available and don’t keep very long in the fridge, so I often use dried herbs. Lately, I’ve been using freeze dried herbs. They are a balance between the freshness of fresh herbs and the shelf life of dried herbs! I made this for the first time tonight for supper. I am generally not a great cook, but this recipe was easy to follow and it turned out great! It was quick and easy to prepare. It made a delicious meal and I’m sure will also be just as good leftover tomorrow. I will definitely be making this again!